When the "Pink Star" goes to auction in November, the nearly 60-carat pink diamond is expected to bring as much as $60 million. An oval-cut stone, the "Pink Star" is graded by the Gemological Institute of American (GIA) as the world's largest internally flawless fancy vivid pink diamond. This could make pink diamond engagement rings very popular. Mined by the DeBeers Company in Africa, Steinmetz Diamonds polished and cut the stone for two years. It was originally known as the "Steinmetz Diamond" when it was shown in 2003 as part of the "Splendor of Diamonds" exhibit held in Washington, D.C. at the Smithsonian Institution. It was renamed when it was sold in 2007.The "Pink Star" is scheduled to be sold again in Geneva on November 13, 2013. Another large pink diamond, the "Graff Pink," which weighs in at 24.78 carats, fetched $45.6 million at auction in 2010, and the "Pink Star" is over twice as large. The record for the third largest sum for a gemstone sold at auction is held by "Princie," a fancy intense pink diamond that sold for $39.3 million in New York last spring. Pink diamonds get their unique hue from plastic deformation, an unusual condition caused by pressure changes during the stone's formation. Colored stones are the rarest specimens, making up only 0.01 percent of all stones mined, and pink diamond engagement rings are considered especially unique and beautiful. In times of economic uncertainty, investors often turn to gemstones for security. German jewelry dealer Otto Jakob says it's a good time to buy diamonds. People who are concerned about their wealth often put their cash into investment-quality diamonds.Investing in gems gives people a sense of security. There is also a demand for colored stones right now because investors in Asia have been collecting them and there aren't that many going up for auction. This is expected to push prices higher. Pink diamonds entered the public consciousness with the Peter Sellers movie, "The Pink Panther," about jewel thieves who were after a legendary pink diamond. Although that diamond was a Hollywood creation, pink diamond engagement rings have been gaining in popularity ever since. When Ben Affleck proposed to Jennifer Lopez in 2002, he did it with one of Harry Winston's pink diamond engagement rings. Juno Jewelry creates one-of-a-kind designs from the highest quality materials and can substitute colored stones for white diamonds in any of our creations. You get a certificate of authenticity with every stone you buy. 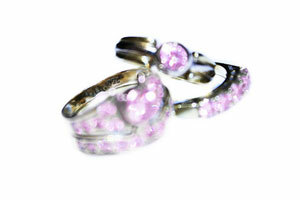 If pink is your color, contact us at (213)291-9720, or email service@junojewelry.com.